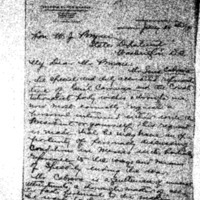 Charles A. Douglas writes to William Jennings Bryan regarding Mexico and a meeting with the President. Mr Luis Cabrera the special and duly accredited representative of Gen’l Carranza and the Constitutionalist party wishes, & through me, now most earnestly requests a personal interview either with the President or yourself. This request is made that he may have an opportunity of personally discussing conditions in Mexico with particular reference to the ways and means of speedily ending the war. Mr Cabrera is a gentleman of unusual attainments, a thorough master of all the facts pertinent to the matters he wants to discuss, and withal is profoundly concerned for the welfare of his country & convinced that the triumph of the Constitutionalist cause will make peace permanent & prosperity widespread in Mexico. I beg therefore that you present this request to the President with yr recommendation that a meeting be arranged for such time & place as may be designated. While Mr Cabrera will of course see & confer with anyone that may be named, he specially wishes to present his own case to the President or to the Secretary of State. Douglas, Charles A., 1862-1939, “Charles A. Douglas to William Jennings Bryan,” 1914 January 19, WWP18294, First Year Wilson Papers, Woodrow Wilson Presidential Library & Museum, Staunton, Virginia.